Grading the trades: Who won 2019's major swaps so far? Published: Dec. 2, 2018 at 08:52 p.m.
Pittsburgh Steelers running back James Conner darts through the hole for his second rushing touchdown. Published: Dec. 2, 2018 at 08:38 p.m.
Pittsburgh Steelers running back James Conner bursts past defenders for an early touchdown run. 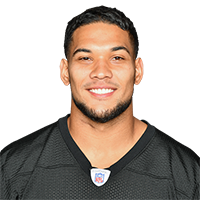 Published: Nov. 8, 2018 at 08:59 p.m.
Pittsburgh Steelers running back James Conner bursts up the middle for his 10th rushing touchdown. Published: Nov. 4, 2018 at 01:43 p.m.
Pittsburgh Steelers rookie running back James Conner beats Eric Weddle to pylon for 7-yard touchdown.